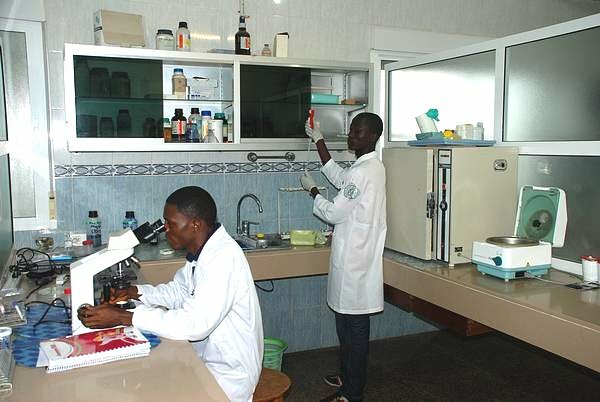 Saint Joseph´s Catholic Hospital´s laboratory is a referral unit in Monrovia and its surroundings, with 114,430 tests performed in 2012 and values increasing every year. The lab offers 24 hour services. Clinical analysis is based on the healthcare process and on the study of different biological samples to obtain an objective result, whether quantitative or qualitative. At Saint Joseph´s Catholic Hospital´s Laboratory we had a thermal cycler, known as well as Polymerase Chain Reaction (PCR) machine, that enables the amplification of DNA segments. We are working closely with the National Diagnostics Unit (NDU) to give this equipment the most effective use. The tests are performed by 7 lab technicians, who receive assistance and training every year from different foreign professionals. Dr. Aurelio Velasco, from the Microbiology Service of San Carlos Clinic Hospital of Madrid, comes since 1991 for one month every year to work with us, and in 2012, two doctors specialized in Microbiology and Hematology and a lab technician from Saint John of God´s Hospital in Aljarafe, Sevilla, Spain, came to give a training course to our technicians, two teachers of Mother Patern College of Health Sciences and lab technicians from other Liberian hospitals. Dr. Irene Jara, from Saint John of God´s Hospital of Aljarafe, Spain, working at Saint Joseph´s Catholic Hospital with one of the Laboratory technicians (Photo: M. Tellaeche). 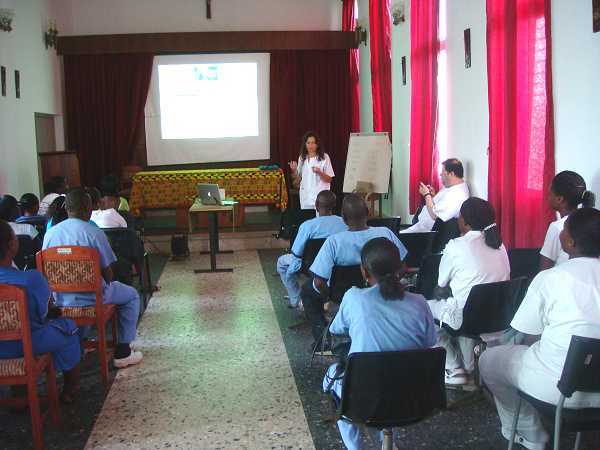 Dr. Monica Chavez, from Saint John of God´s Hospital of Aljarafe, Spain, during a workshop on Laboratory technics held in the Saint Joseph´s Catholic Hospital (Photo: M. Tellaeche).